Anonymity gives the likelihood to wear a cover, to end up being anyone you need to be. Also, anonymous communication permits you to quit being bashful and act naturally. It is a chance to pull in individuals whom you won't have the confidence to get to know, all things considered. 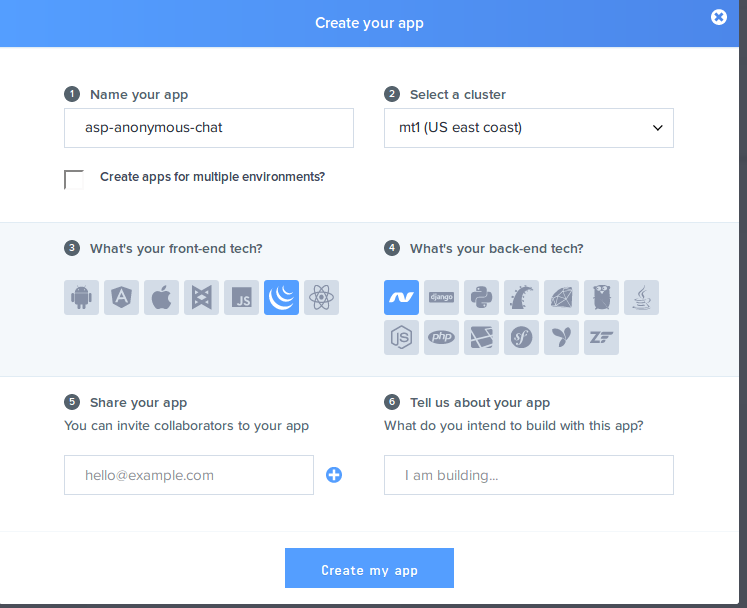 Today, we will create a realtime public anonymous group chat app using C# ASP.NET and Pusher. This tutorial assumes the reader has basic knowledge of C# ASP.NET. We need to sign up on Pusher and create a new app, and also copy our secret, application key and application id. We need to create a new Asp.Net MVC application, so we open up Visual Studio, select new project from the sidebar, under templates, select Visual C#, next, select web, and finally in the middle section, select ASP.NET Web Application. Now we are almost ready. The next step will be to install the official Pusher library for .Net using the NuGet Package. To do this, we go to tools on the top bar, click on NuGet Package Manager, on the dropdown we select Package Manager Console. After doing this, we will see the Package Manager Console at the bottom of our Visual Studio as shown below. The next step is to install the library, by running the following command in the console. Once this is done, our environment has now been set up. Now that our environment is set up and ready, let us dive into writing some code. By default, Visual Studio creates three controllers for us, however we will be using the HomeController for the logic of our chat application. The first thing we want to do is to delete the default index.cshtml file under the Views/Home folder, and create a new view file named index.cshtml that does not have a master layout. In our new index.cshtml file, let us copy the following contents into it. Now we have to trigger an event when someone enters some text and clicks the send button. Let's open up our index.cshtml file again and add the following at the end of the page. In the above code, we have attached a click event listener to the element with the ID of btn-chat which happens to be our button. Once the button is clicked, the code will take the value of the element with the id of btn-input which happens to be our text box, and send an AJAX call to our Pushermessage function in our HomeController. However, we are yet to create the Pushermessage function that responds to the AJAX call. Let us move to our HomeController, and paste the following code after the index function. In the last two block of codes, we have defined our Pushermessage function and we also decorated it with the [HttpPost] decorator, so Asp.Net knows it’s a function for POST requests. In this function, we instantiate Pusher, using our appId, appKey and appSecret respectively. We then went ahead to trigger a channel called asp_channel and an event called asp_event, sending in two values with it. At this point, we are done with emitting the message to data. Let us now move onto listening for the event on the client side and displaying the new message. Let us open up our index.cshtml file, and add the following lines of code after our click event. In the above block of code, we declared a variable called pusher and we set it to an instance of a new Pusher object, passing in our appKey. Next, we declared a variable called my_channel, and we call the Pusher subscribe method to our channel, which in this case, is called asp_channel. In this article, we have demonstrated how to create a public anonymous chat application using C# ASP.NET and Pusher. We have gone over the process of setting up the environment, using the NuGet Package Console to install packages as well as implementing the chat application. Many other realtime applications can be built using Pusher and ASP.NET, it's left for you to decide which awesome realtime app you'll be building next.